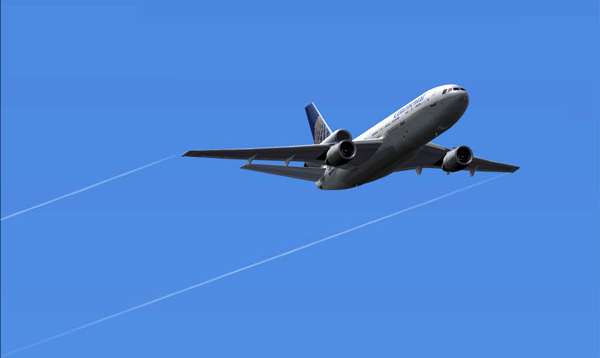 New equipment for flight simulation gamers is at an all time drought. Most joystick designs are over 10 years old and while they have improved dramatically in some regards overall the designs put together in the last few years are essentially unchanged from designs made 15 years ago. Yes, the joysticks from Thrustmaster, CH andSaitek are improved internally and add functionality not found pre Win98 but physically there hasn’t been much of a change in the design of these sticks. 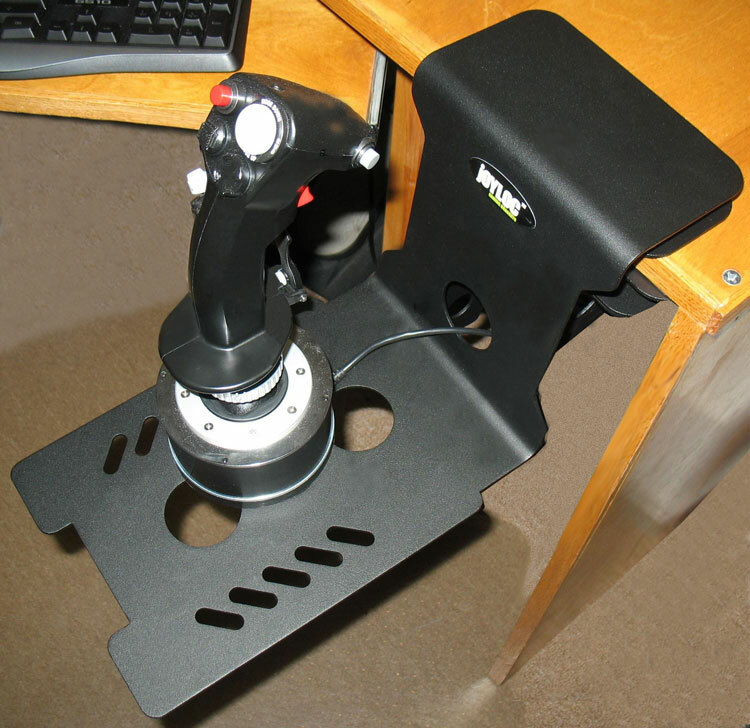 Probably the biggest problems with these HOTAS controllers is the inability to place them securely with most computer seat and desk setups. Options include putting them in your lap, putting them on the pull outs for your desk, or trying to design some kind of custom system that puts the joystick and throttle into a more ergonomic position. Some of these items range from simple bolt on items that attach to your chair to large, unwieldy virtual cockpits that take up large portions of your room. A lot of preferences of course are related to your dedication and the amount of crap that your significant other allows in your room. While an F-16 cockpit really looks cool many people’s wives find strapping into a cockpit just to do the taxes somewhat, well… stupid. Into this mix comes a potential compromise item, one that might fix the need for a HOTAS holder that is ergonomically useful while at the same time not unsavory for the non-simulator fanatics in the household. 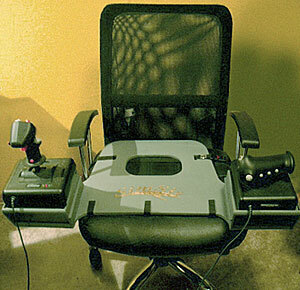 The SimSit, designed by Geoffrey Lee, is not a revolutionary approach to the virtual cockpit, but it might make the virtual pilot’s life more enjoyable while at the same time keep the home office looking like an office. SimSit with about a half a dozen games and have several opinions of it. The idea for Geoff was to see if the SimSit would be a viable product to develop for the flight simulation market. Ultimately my opinion will be directed in that manner. There are some things that I really like about the device, some things that I think may show cause for concern. While this is a preview of the product please note that this preview may or may not represent the final product. Based upon my personal opinions of the SimSit Geoffrey may make substantial changes, small changes, or no changes whatsoever. 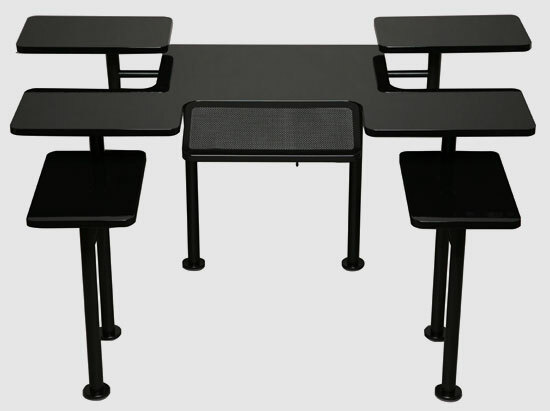 The SimSit that I evaluated is definitely a pre-production model so things like overall fit and finish will not be evaluated. What is being evaluated is what is good about the idea, what could be tweaked, and what may be potential show stoppers for the SimSit.